Amatrol’s Portable Motor Control Learning System (990-MC1) features standard industry components like a 3-phase AC squirrel cage motor and uses 3-phase AC for power and 24 VDC for control all packed within a space-saving, portable product used for ladder logic programming training. Learners use these industrial components to study the operation, installation, and applications for electric relay control of AC motors. The Motor Control training system also includes lockout/tagout components to teach vital motor control safety steps when working with industrial motors. Electronic fault insertion can be added to this industrial training system to teach valuable troubleshooting skills that will prepare learners for real-world industrial maintenance competencies. Nowhere else can you find this breadth of training in a portable platform! Motor Control is prevalent in all industries, from conveyor control to driving large utility pumps. The Motor Control training system builds both knowledge and skills across topics like manual motor control, control ladder logic, motor starters, and automatic input devices. This innovative approach to bringing motor control training to wherever you need is one example of why Amatrol is the world’s leader in skills-based, interactive technical learning. Build Motor Control Skills Anywhere! Developing real-world skills takes practice on industry relevant components and systems. The Motor Control training system includes the most commonly utilized 3-phase AC squirrel cage motor used in industry as well as other industry-standard components, such as a drum switch, reversing motor contactors, a pressure switch, and a float switch, so that learners practice skills on mechanisms that they’ll see in the field. Beginning at the foundation of motor control knowledge, the Motor Control training course’s extensive multimedia curriculum builds on basics to advance to topics like three-wire start/stop control, reversing magnetic motor starter, and on-delay and off-delay timers. As the learner completes each new topic, they’ll use this theoretical knowledge to complete hands-on skills. As an example, learners will study about the function, operation, and types of control relays and then practice hands-on skills by actually connecting and operating a control relay in a circuit. Motor Control training system is set within a durable ABS plastic case featuring wheels and a handle so that moving this world-class trainer from one destination to another is safe and easy. Another advantage of the Motor Control training system is the minimal set-up time. Once the case’s cover is removed, the trainer sits upright on the training surface. Optional Fault Insertion for Troubleshooting Skills Using FaultPro! This system can be enhanced to include electronic faults by adding the 99-FTSMC1. This modification will allow users to troubleshoot over 30 faults on components such as the main power circuit breaker, control relays, the pressure switch, and many more! The 990-MC1F (Portable Motor Control Troubleshooting Learning System) includes everything on the 990-MC1, but has electronic fault insertion system pre-installed. As the industry’s premier program utilizing electronic faults, FaultPro allows instructors to instantly set and tailor faults to test a learner’s weaknesses, turn them into strengths, and prepares learners to solve real-world technical problems once they’re in the field. 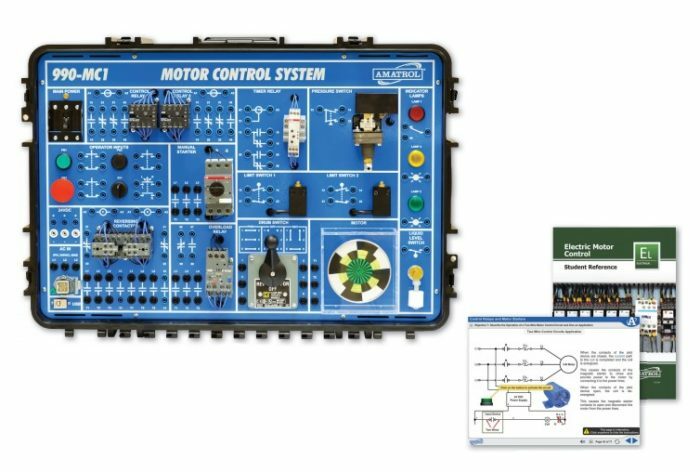 A sample copy of the Portable Electric Motor Control Learning System’s Student Reference Guide is also included with the system for your evaluation. Sourced from the system’s multimedia curriculum, the Student Reference Guide takes the entire series’ technical content contained in the learning objectives and combines them into one perfect-bound book. Student Reference Guides supplement this course by providing a condensed, inexpensive reference tool that learners will find invaluable once they finish their training making it the perfect course takeaway.